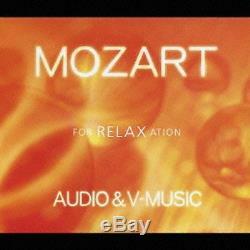 Title: Mozart Relaxation Box - Audio & V-music [2CD+DVD] (Japan Import) Format: CD Album Product Code: BVCC-38386 ISBN: 4988017643365 Label (Brand): Sony Music Distribution Release Date: Oct 25, 2006 Number of Discs: 3 Japanese Import. Audiophile Quality Explained - Hearing it makes a difference! Item shown is available at time of listing through our distributor in Japan. We specialize in obtaining rare imports! Worldwide Additional Item(s) cost. Covered if delays in transit occur. ITEM MUST BE RETUNED WITHIN: 14 DAYS. Bottom line, we want you happy! We carry a wide variety of classical music imports, direct from Japan. We stock optimal music formats such as SHM-CD, BLU-SPEC, SA-CD, HQCD, XRCD, and MORE! Mozart Relaxation Box Audio & V-music 2CD+DVD CD (Japan)" is in sale since Thursday, March 24, 2016. This item is in the category "Music\CDs".